I apologize for not posting much lately. 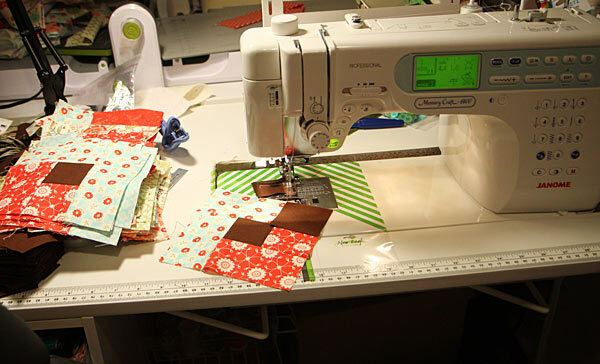 I am working on this quilt and it's slow going-it's not like a card that I can turn out in one night (but there are people who can make a whole quilt in one day. I am not one of those people). It's for my friend Melissa and it will be (when it's done) a boxy stars quilt made with Moda Bliss fabric. I can't wait to see this come together some more-it's an amazing line and a great pattern. So cheer me on because I have a hard time keeping up with my sewing. I love quilts and it always impresses me to see someone making one ... kudos to you Gale! Sweet sewing machine! Have fun! good luck with the quilt. I myself would never have the patience for making one as me and the sewing machine never see eye to eye. LOL! I make quilts but really, really, simple ones! My hat's off to you for your ambitious endeavor! Your quilt will be gorgeous when it is completed Gale. You can do it! And I am sure it will be absolutely beautiful when you are done! I love the colors. Moda has such fun fabrics. I started taking quilting lessons once because I love quilts and then realized that I hate sewing. LOL I'm sure you can get this done and that it'll look great!